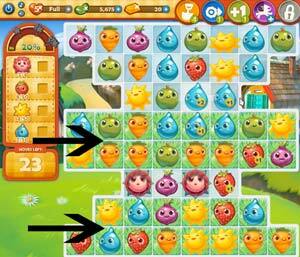 These Farm Heroes level 48 cheats and tips will help you beat level 48 of Farm Heroes. 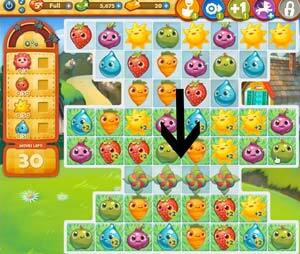 The objective of Farm Heroes level 48 is to collect 4 flowers, 50 strawberries, 50 suns and 50 water droplets in 30 moves. 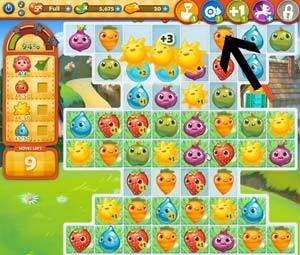 In Farm Heroes Saga level 48 you have 30 moves to collect 4 flowers, 50 strawberries, 50 suns, and 50 water droplets. Although the 4 flowers are beside each other, you still want to focus on making combinations around them. Making combinations around them will help to open them up and eventually be collected. If you do not have any moves in the bottom half of the board, you have to wait until you remove the flowers that are in the way. When you make moves in the grass, they count for a higher point value. This is important in this level since you have so many a lot of resources to collect. There is plenty of grass on the board for you to make large combinations. Continue to look around the board throughout this level for different options. If you are running out of moves at the end of the game, do not be afraid to use a booster to help you out! Different boosters can be very useful in this level to help you to collect all of the resources needed. If you are able to collect all of the resources and have moves left over, the Hero Mode will activate.